In a riotously dystopic future Zimbabwe, three privileged siblings tumble into an adventure involving a criminal talking monkey, trash-people, a traditional village preserved against time, and Soul Stealers. Hot on their trail are Ear, Eye and Arm, detectives whose qualifications include mutation-enhanced senses and a gift certificate to Mr. Thirsty's Beer Hall masquerading as a diploma. Hilarious, intricate, outrageously imagined, and truly creepy-- a winner! The year is 2194, and Tendai, Rita, and Kuda are the children of Zimbabwe's wealthy and powerful chief of security. They've escaped from their father's estate to explore the dangerous city of Harare--and promptly disappear. Their parents call in the Ear, the Eye, and the Arm, detectives whose exposure to nuclear waste has given them special powers. Together they must save the children from the evils of the past, the technology of the future, and criminals with plans much more sinister than anyone could have imagined. 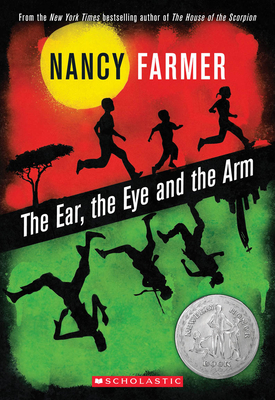 Before becoming a writer, Nancy Farmer lived in Africa, and her work there included monitoring water weeds in Mozambique and helping to control tsetse flies in Zimbabwe. Since then, she has earned a host of prestigious awards for her writing, including three Newbery Honors for THE EAR, THE EYE AND THE ARM; A GIRL NAMED DISASTER; and THE HOUSE OF THE SCORPION. She lives in Menlo Park, California, with her husband. Visit her online at www.nancyfarmerwebsite.com.